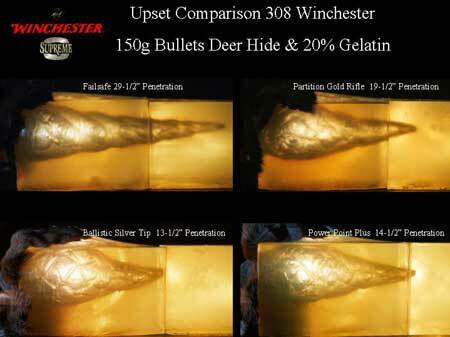 Below you can see a visual comparison of penetration tests using the four bullet types available in Winchester Supreme Ammunition. The types are Failsafe, Partition Gold Rifle, Ballistic Silver Tip and Power Point Plus. When hunting you need to pick your bullet for the type of game you are pursuing and the results you need. In the photograph below these bullets were shot into deer hide covering a 20% gelatin block. The bullets had the following penetration: Failsafe - 29 1/2", Partition Gold Rifle - 19 1/2", Ballistic Silver Tip - 13 1/2", Power Point Plus - 14 1/2".